I noted this item on EBAY showing the ESP-03 at well under £2 each.. Not sure about those ceramic antenna – anyone any experience of how they compare to the excellent PCB version on the ESP-01 ?? Another item of note – I see there is a new LUA update out – looking forward to checking that out at the weekend and I’ll do a write up – apparently it’s based on the 0.9.5 version of the SDK. Is this out of BETA – and if it is does anyone have the link? And any updated documentation so we know what’s changed? I have to say that Espressif don’t do the best job when it comes to promoting their own updates. That’s it for now – later this week I plan to put together a temperature sensor using only the ESP-01 and even consider sticking a lithium and a solar cell on it (I know, not the best time of the year for solar power) – more to have a permanent test rig than anything else sending out MQTT data. The /TIME/ message I set to run every 10 seconds on my PC 3 days ago using Really Small Message Broker set up as a service, and MQTT-spy – is still ticking away (I can test it in meetings using another copy of MQTT-spy. You might have noticed I did some frighteningly fast message blasting and everything help up ok. I expect soon to have MQTT traffic running back and forth – I’ve at least 3 locations that need external solar powered temperature and humidity monitoring. MQTT-spy is due shortly to get some more improvements – looking forward to it – as for RSMB – I can’t think of anything wrong with it! “Got up early one morning….” well, actually it was one evening a couple of week ago, I was frantically struggling to use the Arduino serial monitor to test the new ESP-01 modules (which appear to have had babies, they’re all over the place now) and not getting very far, one line at a time, repeating the same typing mistakes over and over… and I decided I needed something better. Windows programming is not something I’ve done for a while (as against web and App programming). The last time I wrote anything major was back in the dark ages of VB6 and so I was expecting to fail completely with Visual Studio though I use it a lot for embedded C programming, desktop apps are another matter. I managed to find some code to take data from the serial port, put it up on screen and vice-versa and the funny thing is it all started coming back to me. The project that was going to take me the drinking time of a cup of coffee took all night and I was so happy with it I stuck a copy on the web. I have to say version 0.1 looked pretty naff. Back to programming the pesky ESP8266 chips and once again I found myself getting more and more frustrated. I needed places to store things temporarily, I got annoyed when as happened one night, the power went off mid-stream and I lost all my temporary notes and… well, if you’ve worked on these chips, having to discover the bugs as you go along and repeating the same stuff with minor variations until you got there, you’ll know exactly how I feel. On top of that, the interpreter hates you sending stuff quickly and whenever I looked it up on the web I kept getting recommended to use some Linux program or other – sorry guys.. NO. Fast forward to this morning where I realised just what an amazing little tool I’d put together with a few late nights behind me (and I mean LATE). Now, before I say any more, apologies to anyone on Windows XP – I can’t help here because the Microsoft environment really isn’t supporting XP any more – it’s not me, the code just won’t work on XP. As for the Linux guys, well, you’ve probably got your own tools and they’ll be far better so I’m not worried about you so this is for Windows 7 and upwards. So specific needs when messing with these chips – and especially when using the Lua interpreter – you need to be able to send blocks of code to the chip over and over as your program evolves and you need to be able to store temporary solutions, lots of them. The Lua interpreter has a strange file system that means when creating a file you need to wrap your code in the most horrible mess which makes it almost unreadable – just what you don’t need when bugs creep in. You need delays between each line you send, maybe up to half a second as the interpreter does not like being sent serial data when it’s busy. You also need to be able to blow firmware onto the boards but I haven’t gotten that far yet and anyway there are some decent Windows tools out there to do just that. And so here we are two weeks later – I have the tool I need to do the job and I realise I’ve done a pretty awful job of documentation. So above right you should see the editor. 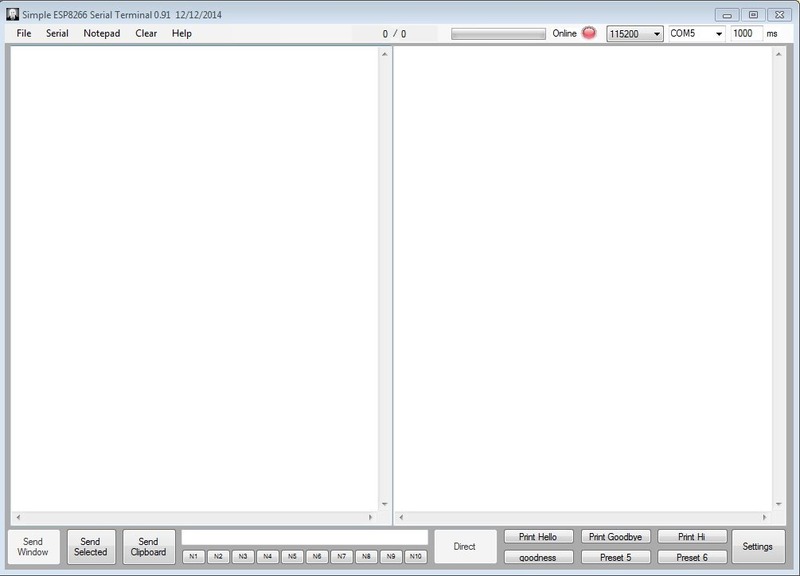 The most important bits are the two big windows – on the left is the area you type in – multi line – and on the right is the output from the serial line – i.e. what comes back from the chip. 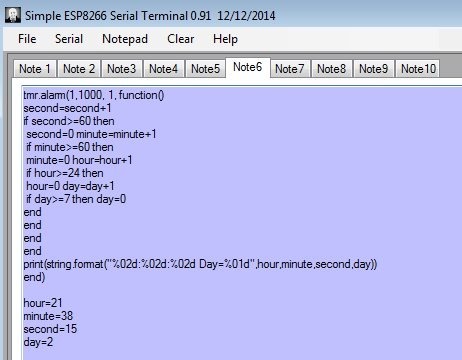 In the simplest case you set up the serial port you want, ensure it’s set to 9600 baud, select “serial – open” and you’re all set (I’m assuming you have an FTDI or similar on your USB lead, talking to the serial on the ESP8266 device, I’m also assuming you fed 3v3 to the device and are using some means of ensuring the device never gets hit with anything above 3v3). Disclaimer: if any of the above or the use of the terminal breaks your computer, it’s not my fault. I’m providing this freely just because I’ve no reason not to but without support. I normally have several projects going on and find it handy to have stuff lying around – this beats yellow sticky notes full of code any day. There’s a big HIDE button at the bottom to get rid of these – and don’t be fooled by access to the ribbon when Notepad is open – it’s disabled. Then there are those notes.. N1 to 10 let you send the entire contents of any of those notepads. Finally there is a one-line window which you can send directly with the “Direct” button and that has autocomplete for some of the more useful commands. To the right there are some presets, 6 in all – and in SETTINGS you can define their names and what gets sent out. And that takes us to settings. 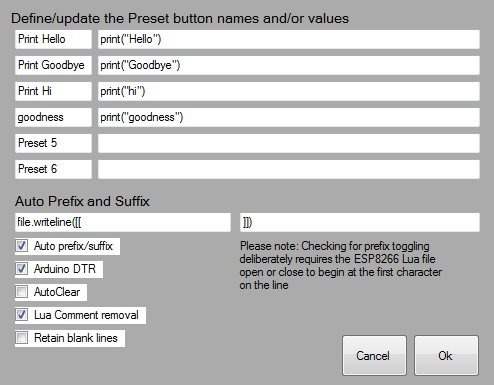 Firstly you’ll see the 6 preset buttons – their titles and contents – note you DO have to press OK to save these – most things outside of this SETTINGS box just save automatically. Auto prefix and suffix I suggest you leave be unless you’re NOT messing with Lua and the “Auto prefix/Suffix” tickbox determines whether or not you use this – essentially if “File.open” is see starting at the LEFTMOST character in your input window, these prefix/suffix characters will be added to your line as they are being sent out until the system sees a “File.close” again starting in the leftmost column of your input window. Oh apologies to the guys who now find the Lua interpreter returns NIL when empty… I think that was my idea. I keep firing stuff off to Zeroday who is doing a cracking job on what can’t be a trivial project. Oh here’s the dropbox link – not sure how long this will stay valid but you can always let me know if it disappears. 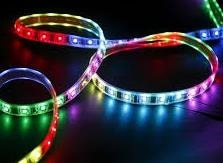 Note: If you’re interested in what I’m doing here… join my millions of followers on the ESP8266 Facebook page (actually it was 41 at last count) https://www.facebook.com/esp8266wifi or check me out on Google+ https://plus.google.com/+PeterScargill if Twitter is your thing… https://twitter.com/scargill erm, what else.. oh yes www.scargill.net or www.bedrock.es or www.hollyberry-cottage.co.uk … I think that’s about it. 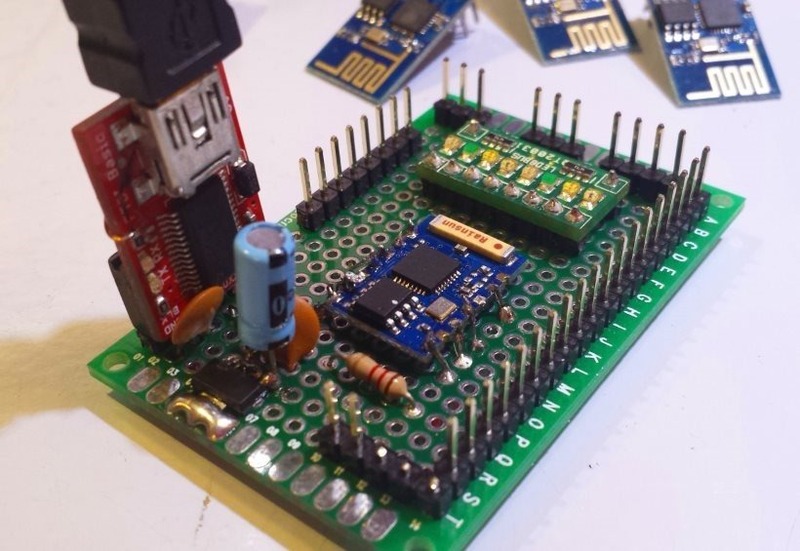 My first attempt to fire something back for the help I’ve had from others, firstly to get past the bottleneck of understanding the ESP8266 boards and secondly the firmware options – in this case I’m assuming you are interested in the Lua firmware. I’m going to give the slight advantage here (for a change) to Windows users. The reason for that is simple – that’s what I’m using. I’ve developed a serial terminal for people like me to play with when tackling Lua. I’ve spent the better part of a couple of weeks to get to this point. 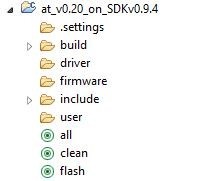 Go here to get the firmware developed by Zeroday and check out his documentation here. You will also most likely need the flasher from here. In a subfolder of the firmware directory (you will download a ZIP file) you’ll find a file called nodemcu_512k.bin – that’s it, just the one file. You can load that up, set your serial terminal to 9600 baud. If you want a serial terminal for Windows 7 upwards with no warranty or support but likely the best tool for the job you can grab my installation zip here. If that link doesn’t work, let me know. Why do I claim it’s the best? Because I tried all the rest and for this particular application they were lacking – so I built my own. Once you are up and running with whatever tools, you’ll want to test the firmware. Simply try this.. If that works, its up and running (don’t forget to ground GPIO_00 when programming the firmware and then remove it and cycle the power before trying to use it). I’ve had success with the ESP-03 module but if you can’t manage the small soldering the ESP-01 is better. I understand the ESP-12 has more pins and 0.1” spacing but I’ve not tried it yet. Load that up onto your site and call the program – whatever you call it – let’s call it time123456.php – note I’ve referred to this in the code but call it whatever you like, really. I built this for my own private purposes – there is some command line info you can add for different areas, this returns info for the UK. As you can see it returns the time in a standard format and also as text. It also returns dawn and dusk times for the same location. Why did I do this – I found that time servers could be slow and didn’t give me what I wanted – so I built this. Here is the PHP code. I don’t pretend to be a PHP master – it’s all just standard stuff. You can dump this on pretty much any PHP site you may have FTP access to. If that’s obvious – make use of it, if not, just use mine. Anyway so now one way or another you have the ability to get the time. 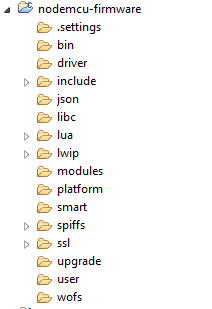 This little program for Lua does a couple of things – it goes to the site and gets the time. Why do I use an IP address as well as the website address? Because I can’t get the Lua Name lookup code to work reliably – I’ve contacted Zeroday and when that is ultra-reliable we can forget IP addresses. For now it’s a necessary evil. Before we start, you see the bits in bold – if you don’t use my terminal, you’ll need to wrap each of those lines in file.writeline([[ and ]]) so that they end up being written to Lua as a file.. the reason you want to do that a lot is to minimise the use of RAM. The reason you’d want to do that would fill a lot of space. So essentially you are initialising some variables – you’ll need to put in your website address and IP address (IP lookup). You are creating a FILE in Lua called getTime.lua – that file when called will go off and get the time from your server – and put it into the time and date variables – clearly without that they’ll start at zero. The second part starts off a repeating timer (you now have 7 of them numbered 0-6) – which operates every second The operation is fairly obvious – every second in this case it will print out the time and date – note the string formatter – handy to know about. So we initialise variables, create a file to go get the time, set up the timer then run the file. In real life the local clock does not handle months and years etc, so I’d suggest setting up another timer or a means of doing that dofile(“getTime.lua”) on power up then once a day maybe after midnight. So this of course is only a tiny component – you have plenty of FLASH (but not a lot of RAM). You might set up some kind of timer to turn something on and off- see the Lua documentation – depending on which board you have, you might have 3 or 4 outputs – in my case (I’ve not strung all of these together yet) I can read temperature. With a little mod you can have the program understand lighting up time and dawn time as well. So now you have Internet controlled temperature monitoring, relay out and a real time clock with dusk and dawn ability.. if that doesn’t start your imagination going… well. And all for what, well under a tenner including Chinese power supply? At a later time I’ll detail the other components of the larger project above. 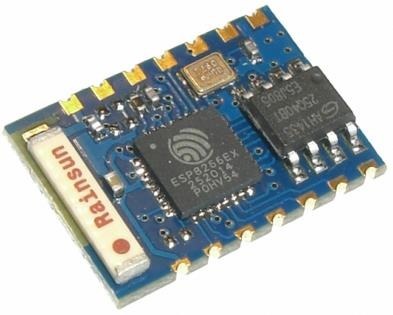 Check out my other stuff at https://scargill.wordpress.com , www.scargill.net and for Facebook users, https://www.facebook.com/esp8266wifi – this is just the beginning. I nearly have this running – I could do with a little help though! The latest LUA has more than one timer – so you can spare one for a clock. There you go – THAT was easy !! So – I want to extract at least 3 and more likely all 6 numbers out of there – so I can punch them into my variables above. I can do it one at a time but it would be NEAT if Lua could return 6 variables at once… like…. Except of course that the last bit of that is rubbish because I’m rubbish at regular expressions – I don’t suppose any of you Lua masters out there would know how to take that string above and convert it into the numbers I want? I promise if someone provides a working solution, I’llrepay by publishing the source of my PHP page – which actually returns a lot more in the string. Why not figure out how to access an NTP server? I find them slow – this is instant and I get more useful info back. Two new updates out – the actual LUA interpreter (grab the ZIP file – find the latest update in a directory) an the program for Windows to actually blow the chips – both 32 bit and 64 bit Windows. So we now have an updated LUA interpreter – and updated file to blow firmware and my latest editor update which simplifies the process of programming – and now – I’m working on my next blog – a complete, working and USEFUL app. I’ve had a complete re-think about how to handle this and have a stable app running – just needs a little R&D on file handling and I’ll be back in here – it will be worth the wait!! !